There is nothing I hate more in diet culture than the term "cheat day". Allowing yourself to "indulge" or eat whatever you want for one or two days a week poses a myriad of problems. We definitely shouldn't be describing food as something we "allow" ourselves to have. Food does not have to be earned or worked for. Food is a basic human right. It infuriates me when people say things along the lines of: "I pushed myself for two hours at the gym today, so now I can allow myself to have those fries at dinner". Now, I know that when it comes to weight loss (for those who need it for health purposes), we do have to incorporate exercise into our weekly habits as a way to expend some of the calories we are consuming. I'm not telling you to stop exercising; rather, I'm trying to get you to reframe the way you view exercise and the way you link it to food. What I hate about "cheat days" is that it gives a negative connotation to certain foods and food groups. I'm not naive; I know that some foods are better for your health than others. But labelling foods as "bad" is what got me into a lot of trouble over the years. There are so many rules out there about refined sugars and flours and dairy and gluten and fat. But the way I live my life is: "everything in moderation". The truth is, I was exposed to a whole range of food when I was in treatment for my eating disorder. Every single "diet culture rule" was broken. Sometimes we would have more than three eggs per day, or add butter to our steamed vegetables, or eat processed and packaged foods for breakfast. But we would also get the chance to make homemade vinaigrettes for our salads, and bake muffins for snack, and use fresh, locally-sourced ingredients. I ate vegetarian meals and meals that incorporated meat. The thing I learned from all of this was that there is no such thing as "bad food". Food is the fuel that allows our bodies to grow and repair and perform all of the tasks and activities we love to do. Food allows us to go to school and learn, and graduate with career goals and dreams that can only be achieved by properly feeding ourselves. Food considered a little bit less healthy should not be reserved for only a couple of days a week. When we restrict ourselves from the foods we love and crave, most of the time we will end up "overeating" on those cheat days. The more you deprive yourself of something, the stronger your cravings will become. Then, out of fear that you won't "allow" yourself these items for awhile, you may overeat (which in turn leads to all kinds of psychological side effects). The key to everything in life is balance. Whether it's work-life balance, or family-friend balance, you can apply the same "balance rules" to nutrition. Now, I am not a nutritionist nor a dietitian, but I have worked closely with several in the past 10 years. Everyone has different health issues and concerns, so please seek advice from a professional before making any kind of serious change to your lifestyle. But what I am trying to get you all to see is there is nothing wrong with eating a piece of cake or a slice of pizza. These foods are not BAD. Sure, they may not have a ton of health benefits, but ultimately they are sources of fuel and energy. So, couple these types of foods with foods that offer a little more in terms of vitamins and nutrients. Don't refrain from eating cake and pizza all week and then "overdo it" on the weekend. Balance everything. I don't "treat myself" because I don't feel the need to justify the fact that I'm eating. I don't "treat myself" because I am trying to break away from labelling food as bad or good. 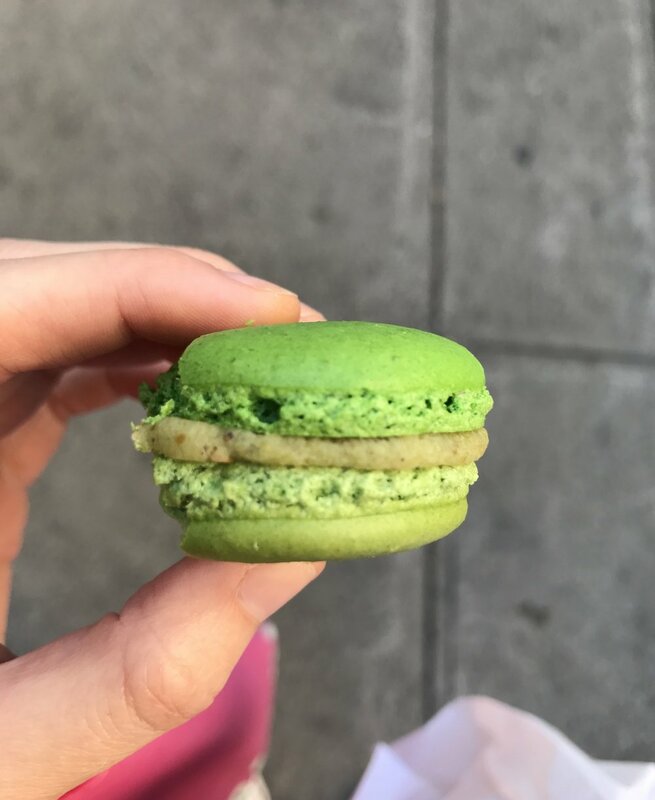 Ultimately, food is fuel, and I try to balance my love for fruits and vegetables and whole grains with my sweet tooth and my appreciation for macaroons and baked goods. What I would love for you to take away from all of this is: food gives us energy. Food is neither bad or good. Everything in moderation and it's all about balance. Simple enough, right? !